All 3 solutions will have positive and negative aspects. Finding the right balance of those should help you to make the right decision. + Full control over creation and budget. + Possibility of learning new things. – You’re spending time that you could spend on something more important. – You need to learn Facebook’s systems and stay updated with all changes. – Unlikely to be able to use all possible tricks for optimization. – It’s easy to forget about running ads. This solution is good for small campaigns – when you don’t have a big budget to optimize and the activity will be rather short. + Cheaper than an agency. + More flexible on price and method of cooperation. + Knows the advertising system already and can manage bigger activity. – Can’t always give you an invoice. – Can be tricky to find someone trustworthy. – You still need to manage them. – It’s still an extra cost. 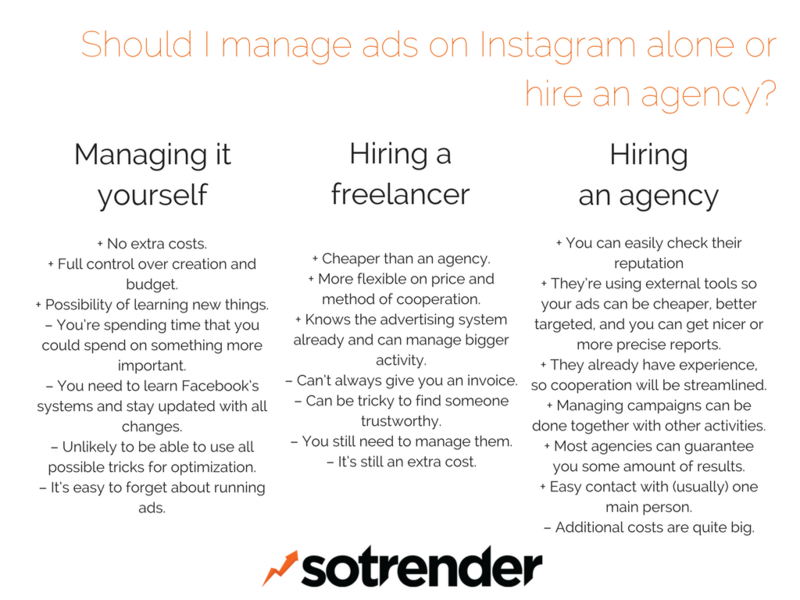 Hiring a freelancer make sense with medium sized campaigns. Make sure that you will test the freelancer with one or two flights – ask him to present a plan, followed by results later. + They’re using external tools so your ads can be cheaper, better targeted, and you can get nicer or more precise reports. + They already have experience, so cooperation will be streamlined. + Managing campaigns can be done together with other activities. + Most agencies can guarantee you some amount of results. + Easy contact with (usually) one main person. – Additional costs are quite big. This solution is perfect for big campaigns when constant control and optimization is key to their success. When choosing an agency, it’s worth seeing with whom they worked already, what kind of results they brought, and how they will report to you.